Finally figured out what that cymbal is. It’s a heavy ride. The weight is bang on with this model as the power ride weighs less. I found this great listing showing a 1982 heavy ride with all the logos and similar stamp. 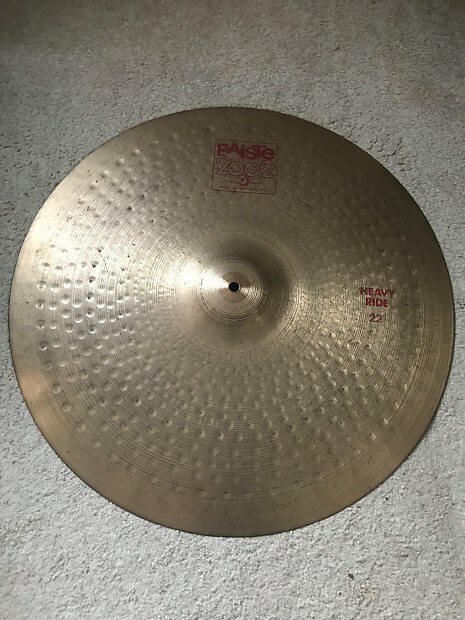 Alas, I already own a Paiste heavy ride that I enjoy very much, so I’m in the market for a lighter ride cymbal. Hopefully the one I’m going to look at and play today will be the one. Thanks to all for participating in this thread and offering up great advice and information. Superb sleuthing! The match on the hammering style pins it down. This is just the sort of work which is helping us slowly build up all the model specific information. Good luck with finding the right cymbal for you when you look at one today. Thank you! Indeed the hammering style is a dead giveaway and matches up perfectly with the photo of the cymbal I originally posted. Great sounding cymbal though. I spent some time listening to the audio files of the cymbal sounds on the Paiste website, and if I didn’t already own a heavy Paiste, I’d most definitely snap this up. Picked up the cymbal today and it’s a beauty! This ride sounds glorious and I love the bell on it. As much as I love my new ride, I was shocked by how good my 1991 Alpha Heavy ride 22” was in comparison. Yes the 2002 sound is more refined but considering the Alpha is considered a budget cymbal, it really held its own, and I’ll still enjoy playing it. The bell on the Alpha is great. Anyone able to date the 2002 based off the serial number? This thing is brand new, rarely played and well worth the $300 I paid for it. The laser serial numbers on the underside started in second half 2011 on present evidence. The first two digits are the year for 8 digit numbers. So yours is a 2016 cymbal. I'm still working on a unified easy to use serial number decoder and gathering more data to pin down the changeover years. One of the complications is that the changes don't start on January 1 so you can find two different styles which come from the same year. There is a more detailed look at serial numbers in cymbal wiki now (thanks to Sean) but I'm trying to find a less daunting and easy to use summary. Exact years are still subject to a little change as we bring things up to date and coordinate all our serial number evidence among members of the Paiste Research Group. Serials start with 6 digits in the later half of 1972, and then move to 8 digits in 1997. * Note I've used 2002 but it is whatever the series name is. Handy to identify series when all the ink has gone. I think I'll ask a moderator to please move this thread into the correct forum: Cymbal Talk rather than General.